Aim: The aim of this study was to analyze the endothelial cell count and morphology of the endothelial cell of donor corneas using Eye Bank Specular Microscope (EBSM). Materials and Methods: Eye bank data of 100 donor corneas procured and processed between January 2016 and December 2017, at an eye bank associated with a medical college hospital were retrospectively analyzed. 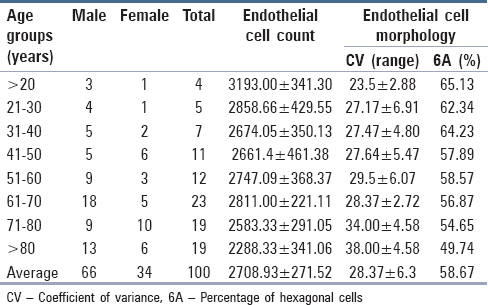 Endothelial cell density (ECD), coefficient of variance (CV), and percentage age of hexagonality (6A) of donor cornea were compared across different age groups, gender, and phakic status of the donor tissue. Results: The mean age of the donors was 63.53 ± 19.92 (range 15–92 years). The mean ECD of the donor cornea was 2708.93 ± 271.52 cells/mm2; the average CV was 28.37 ± 6.3; and the average percentages of hexagonal cells were 63.85%. The cell count was significantly greater in the age group of <20 years when compared to rest of the age groups. There were no significant differences between the age groups on CV and 6A. The ECD of the male donors (66%) was more than that of female donors (34%). The ECD of the phakic donors was significantly more than that of pseudophakic (PP) and aphakic (AP) donors. Conclusion: ECD is significantly greater in younger age group as compared to older age groups; however, there are no significant differences in CV and 6A. The ECD of the phakic donors was more than that of PP and AP donors. Endothelial cell analysis by EBSM alters the final grading of tissues and its subsequent utilization for corneal transplantation with good prognosis for graft survival. Qualitative and quantitative analysis of endothelial cells of donor cornea, is an important factor for donor cornea selection, as it affects the postoperative graft prognosis. The primary goal after corneal transplantation is the preservation of a clear corneal graft. Endothelial cell loss after penetrating keratoplasty is an ongoing process. The endothelial cells can sustain their function and maintain corneal deturgescence and clarity even if their number is decreased by 80%. However, in the long run, this continuous decrease in endothelial cell density (ECD), and their concomitant increase in size and shape are accompanied by a decreased ability to maintain and restore pump and barrier function of the endothelium. A critical point is reached when endothelial function fails, and the cornea swells and becomes hazy. Ultimately graft failure occurs. Thus, surgeons prefer donor corneas with a high preoperative ECD, to offset posttransplant cell loss so that this improves the probability of graft survival. Endothelial structure in human cornea cannot be examined using the usual histological methods that necessitate removal and fixation of the corneal tissue. The cells should be observed in vivo without disturbing the cornea. Eye bank specular microscopy (EBSM) is a means of examining, photographing, and quantitatively evaluating the corneal endothelium. Mattern et al. studied how the judgment on transplantability of the donor cornea, is affected by specular microscopy results. The examination of donor corneal endothelium before its transplantation was first performed by Hoefle et al. in 1970. 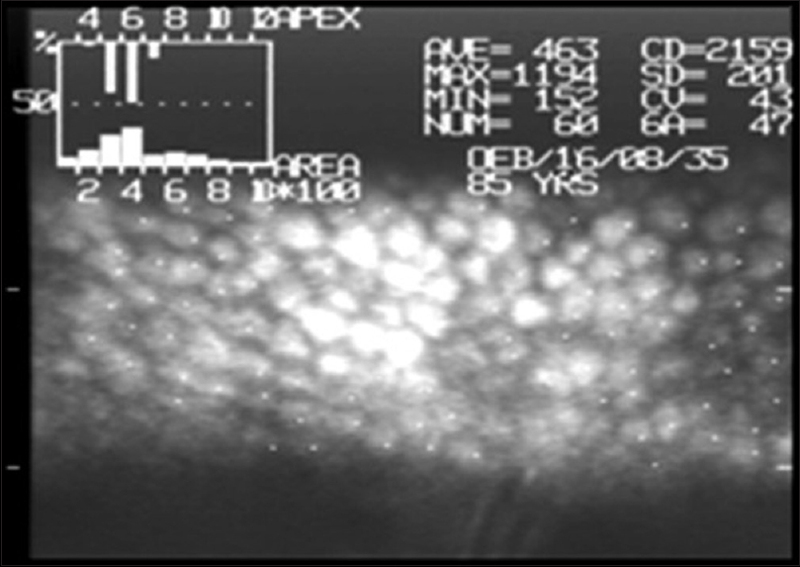 Others have successfully used similar techniques to screen donor eyes.,, With the increased use of isolated corneal storage in preservation media at 4°C, methods for safely examining the donor endothelium during the storage process were developed.,,, The Konan Center method  of noncontact EBSM can accurately assess ECD based on a certain number of contiguous cells. Eye bank-generated specular images from donor corneas can then be analyzed for ECD and its morphology. The purpose of this study was to carry out an analysis of the endothelial cell count and morphology of the donor corneas collected at our eye bank using EBSM. Eye bank data of 100 donor corneas procured and processed at the Medical College Hospital Eye Bank between January 2016 and December 2017 were retrospectively analyzed. Data on donor age, gender, phakic status, and EBSM results were recorded. The “Center method” of Konan specular microscope (Konan Eye Bank Kerato Analyzer, Konan Medical Inc., Japan) was used for morphometric analysis of the endothelial cell. The approval of Institutional Ethical Committee was obtained for this study. Enucleation of the eye was done and details, such as age, gender, cause-of-death, history of surgery done on the eye and history of any diseases, were noted. The tissue blood sample was screened for serum HIV, hepatitis B virus surface antigen, serum venereal disease research laboratory, and hepatitis C. The whole globe of donor eye was subjected to gross examination and slit-lamp biomicroscopy for grading. When found suitable for keratoplasty, the sclerocorneal rim was preserved under strict aseptic condition, appropriately labeled and stored in McCarey-Kaufman media (obtained from Ramayamma International Eye Bank, LV Prasad Eye Institute, Hyderabad, India) at 4°C. Endothelial photographs were taken by the same technician using the EBSM. For each donor cornea, the indicators for quantitative analysis used were the mean ECD and standard deviation (SD) of the mean cell area; while cell morphology was indicated by the coefficient of variance (CV) and percentage of hexagonal cells (6A). [Figure 1], [Figure 2], [Figure 3] ECD, hexagonality ratio (6A), and CV were then analyzed with regard to the age and gender of donor and lens status of donor's eye. In the present study, endothelial cell analysis was done in 100 donor corneas. Data were analyzed using paired and unpaired t-test. P < 0.05 was considered to be statistically significant. The male donors were more 66% (n = 66) than female donors 34% (n = 34). The mean age of the donors (n = 100) was 63.53 ± 19.92 (range 15–92 years). Maximum number of donors was in 61–70 years age group (23%) [Table 1]. The mean ECD of the donor cornea was 2708.93 (±271.52) cells/mm 2, the average CV was 28.37 (±6.3), and the average percentages of hexagonal cells were 63.85%. The cell count was significantly greater in the first age group (<20 years) compared to rest of the age groups (P < 0.05) [Table 1]. ECD of the male donors was more (2757 ± 429.55 mm 2) than female donors (2659.66 ± 429.55 mm 2). The ECD, CV, and 6A were not significantly different between both genders in different age groups [Table 2]. The endothelial cell count of 58% phakic eyes (3098.66 ± 439.55 mm 2) was significantly higher (P < 0.05) as compared to (31%) pseudophakic (PP) (2692.4 ± 461.38) and (11.0%) aphakic (AP) (2322.05 ± 348.13) donor tissue [Table 3]. To obtain a long-term functional transparent graft, adequate corneal ECD is required. Qualitative morphometric analysis of eye bank specular images helps in the evaluation of the endothelium to assess the risks of intraocular surgery and to establish a diagnosis. Qualitative cellular analysis identifies abnormal endothelial structures, and grading of the endothelium can be done, either according to the number or size of the abnormal structures present or on the basis of an overall assessment of endothelial appearance. Thus, EBSM helps in proper selection of donor tissue which finally affects the surgical outcome of surgery. In this study, maximum number of donors was from 61 to 70 years group (23%) [Table 1]. The donor age distribution in similar studies , showed that the majority of the donors was over 60 years of age, with a large group being between 70 and 80 years age group. However, in the study by Ranjan et al., the mean age of donors was 52 ± 21 years, and the majority of the donors was between 41 and 50 years age group. The most common cause-of-death recorded among donors in our study was cardiorespiratory failure (42%) followed by road traffic accident (17%). However, Patel et al. have shown cardiovascular diseases (50.5%) as the major cause-of-death followed by trauma (12.5%). Morphological assessment of the endothelial cells is a generally accepted method of evaluating the suitability of donor corneas for penetrating keratoplasty. In this study, the mean endothelial cell count of the donor cornea was 2708.93 (±271.52) cells/mm 2, the average CV was 28.37 (±6.3), and the average percentages of hexagonal cells were 63.85%. In this study, the ECD of the male donors was more (2757 ± 429.55 mm 2) than female donors (2659.66 ± 429.55 mm 2) which were not significantly different. The mean ECD of donor corneal tissue in a study by Ranjan et al. was 2857 (±551) cells/mm 2, with majority (68%) of corneal tissues having ECD >2500 cells/mm 2. Patel et al. found the mean ECD of transplanted corneas to be 3024 (±324) cells/mm 2. In a study by Jorgen et al., the mean ECD of all the 946 eyes was 2708 (±350) cells/mm 2. In this study, donor tissue from donors <20 years of age had mean ECD of 3193.00 (±341.30) which was significantly higher than of age group of 21–30 years, where ECD was 2858.66 (±429.55); and in age group >81 years, where ECD was 2288.33 (±341.06) cells/mm 2. Corneas obtained from donors of advanced age seem initially unacceptable for transplantation, but specular microscopy helps in changing the grading of donor. Similar to our study, Patel et al. also found a significant correlation between advancing donor age and lower ECD, where in age group <20 years the mean ECD was 3175 cells/mm 2 while in age group of >81 years the mean ECD was 2917 cells/mm 2. In a study by Tufekci et al., the mean ECD was 2884.0 (±457.3), mean SD was 112.7 (±36.2), mean CV was 31.4 (±6.7), and mean hexagonality was 61.1 (±8.6). The ECD was significantly higher in the first age group (5-19 years) compared to rest of the age groups while findings of CV and hexagonality did not show any age-based differences. In our study also, there is a similar finding. Jadeja et al. and Chuw et al. concluded in their studies that large numbers of corneas from donors more than 65 years can be used successfully, to restore vision by revising the grading of the cornea after quantitative and qualitative assessment by specular microscopy. The present study also concludes the same for tissues from donors more than 60 years age. In this study, the corneas of donors above 80 years also got upgraded post-EBSM. The endothelial cell count and morphology of donor cornea need to be objectively evaluated based on the phakic status of the eye. In this study, the endothelial cell count of 58% phakic eyes was 3098.66 ± 439.55 mm 2, which was significantly higher than 31% PP (2692.4 ± 461.38) and 11.0% of AP (2322.05 ± 348.13) donor eyes. The incidence of polymegethism (CV) and pleomorphism (6A) was also analyzed. In six PP corneas, the cells counts were above 2500, and polymegathism was absent. Probst et al., in his study, found a highly significant difference (P < 0.05) in the endothelial counts found in the donor corneas from the phakic eyes (mean ECD = 2,253.4 ± 428.9) when compared to the corneas from PP eyes (mean ECD = 1,701.7 ± 548.2). Johnston et al. compared the endothelial characteristics of the corneas from eyes with intraocular lenses, with a group of matching controls and found no significant difference between the two groups. A study by Jadeja et al. also shows that tissue can be upgraded with the use of EBSM in cases of PP eyes. ECD is significantly greater in younger age group as compared to older age groups; however, there are no significant differences in CV and 6A. Male donors have more ECD than female; however, the difference is not significant. The ECD of the phakic donors was more than that of PP and AP donors. In this study, the donor tissues were either upgraded or downgraded based on EBSM. Thus, specular microscopy helps in proper selection of donor tissue and increases the chances of utilization of eyes for transplantation. Thus, endothelial cell analysis by EBSM alters the final grading of tissues and its subsequent utilization for corneal transplantation with good prognosis for graft survival. Bourne WM, Kaufman HE. The endothelium of clear corneal transplants. Arch Ophthalmol 1976;94:1730-2. Mattern RM, Heck EL, Cavanagh HD. The impact on tissue utilization of screening donor corneas by specular microscopy at the University of Texas Southwestern Medical Center. Cornea 1995;14:562-7. Hoefle FB, Maurice DM, Sibley RC. Human corneal donor material. A method of examination before keratoplasty. Arch Ophthalmol 1970;84:741-4. McCarey BE. Noncontact specular microscopy: A macrophotography technique and some endothelial cell findings. Ophthalmology 1979;86:1848-60. Abbott RL, Forster RK. Clinical specular microscopy and intraocular surgery. Arch Ophthalmol 1979;97:1476-9. Bigar F, Schimmelpfennig B, Gieseler R. Routine evaluation of endothelium in human donor corneas. Albrecht Von Graefes Arch Klin Exp Ophthalmol 1976;200:195-200. Hanna C, Irwin ES. Fate of cells in the corneal graft. Arch Ophthalmol 1962;68:810-17. Bourne WM. Examination and photography of donor corneal endothelium. Arch Ophthalmol 1976;94:1799-800. Roberts CV, Rosskothen HD, Koester CJ. 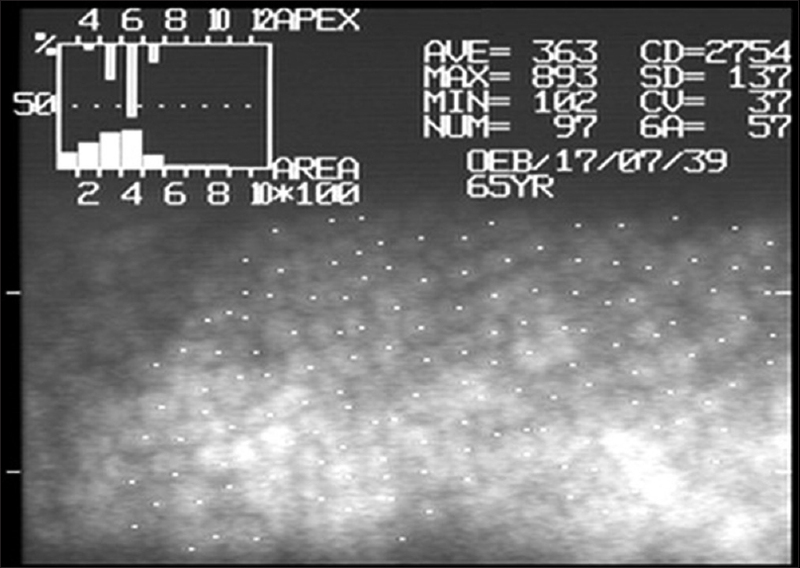 Wide field specular microscopy of excised donor corneas. Arch Ophthalmol 1981;99:881-3. Benetz BA, Yee R, Bidros M, Lass J. Specular microscopy. In: Krachmer JH, Mannis MJ, Holland EJ, editors. Cornea: Fundamentals, Diagnosis and Management. 3rd ed. St. Louis, MO: Mosby Elsevier; 2011. p. 177-203. Dasar LV, Jayashree MP, Gill KS. Demographic profile of eye-donors of Southern India. J Pharm Biomed Sci 2012;16:1-7. Ranjan A, Das S, Sahu SK. Donor and tissue profile of a community eye bank in Eastern India. Indian J Ophthalmol 2014;62:935-7. Wiffen SJ, Nelson LR, Ali AF, Bourne WM. Morphologic assessment of corneal endothelium by specular microscopy in evaluation of donor corneas for transplantation. Cornea 1995;14:554-61. Krohn J, Høvding G. The influence of donor age and cause of death on corneal endothelial cell density. Acta Ophthalmol Scand 2005;83:746-50. Tufekci A, Cevik S, Parmak N, Duman R, Cevik M, Kazanci B, et al. Analysis of the cornea donor data: An eye bank study. Eur Res J 2016;2:30-5. Jadeja JN, Patel BD, Shanbhag SS. The grave necessity to make eye bank specular microscopy mandatory in all eye banks in the subcontinent to improve utilization of scarce donor corneas. Indian J Ophthalmol 2013;61:711-7. Chu W, Dahl P, O'Neill MJ. 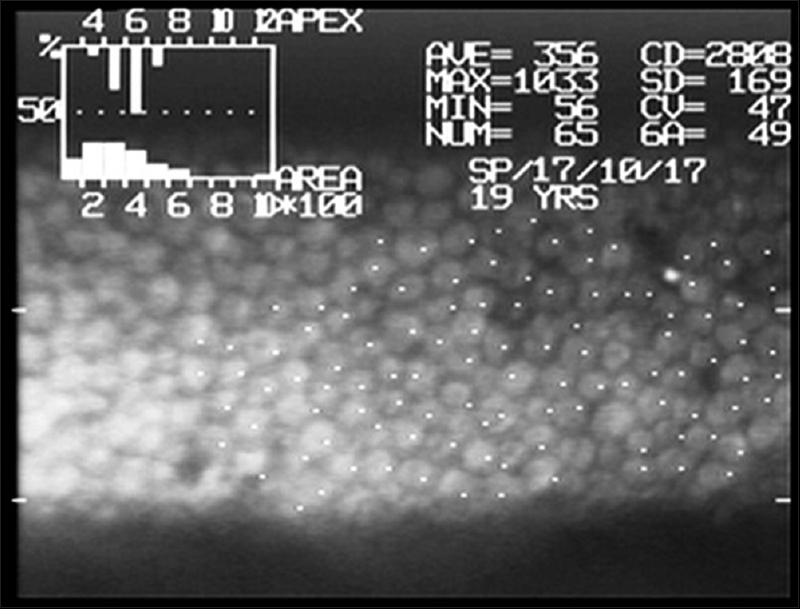 Benefits of specular microscopy in evaluating eye donors aged 66 and older. Cornea 1995;14:568-70, 634. Probst LE, Halfaker BA, Holland EJ. Quality of corneal donor tissue in the greater-than-75-year age group. Cornea 1997;16:507-11. Johnston RH, Hasany S, Rootman DS. Endothelial cell analysis of corneas from donor eyes with an intraocular lens: A comparative study. Cornea 1997;16:531-3.